This waterfront playground is home to the worlds first permanent IMAX film theatre, Cinesphere. Imagine award-winning architecture, glistening water, grassy slopes, laughing children, 96 acres of fun and leisure, an oasis of three human-made islands at the edge of the bustling city of Toronto, population 2.5 million. This waterfront playground is one of the top tourist attractions in North America and most importantly, it's home to the world s first permanent Imax film theater, Cinesphere. Ontario Place turns 25 years young this May. It was created as a showplace for the province of Ontario. 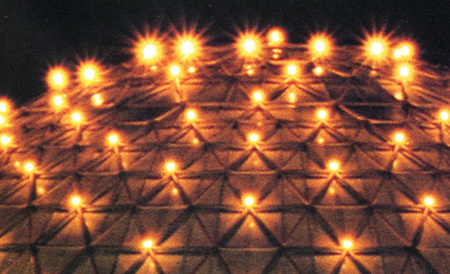 From the day it opened, May 22, 1971, Ontario Place and its Cinesphere Imax theater were touted as being the wave of the future of entertainment, attracting worldwide attention and awards for innovation, distinctive design, and futuristic architecture. Since opening day, nearly 16 million people have been to Cinesphere, and nearly 64 million people have passed through the gates of Ontario Place. Nearly 500,000 people visit Cinesphere each summer. The theater is in 96 acres of award-winning architecture and a parkland setting. The domed Cinesphere theater cradles a screen that stretches six stories high, 60 by 80 feet, with seating for 752 people. Cinesphere is housed in a triodetic domed structure that consists of two-thirds of a sphere sitting on a concrete base completely surrounded by the waters of Lake Ontario. The theater was built to accommodate not only conventional films, but also many of the experimental films produced for Expo '67 in Montreal, Canada, and Expo '70 in Osaka, Japan. Cinesphere's original Imax projector serial #001, which is still used today, was the prototype used at Expo '70. 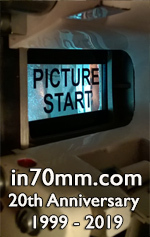 The projector was rebuilt in 1986 and upgraded to Imax HD, 48 frames per second (fps) capability in 1990. The first film featured at Cine-sphere was the award-winning Imax film North of Superior, produced for Ontario Place by Imax founder and filmmaker Graeme Ferguson. Since its debut in 1971, North of Superior has returned numerous times to the big screen due to overwhelming public demand. In its role as the first Imax theater, Cinesphere quickly became one of the most prolific producers of Imax film products. In addition to North of Superior, its film library includes Catch the Sun, Energy, Journey of Discovery, Nomads of the Deep, Ontario Summer-tide, Silent Sky, and Snow Job. The Benson and Hedges, Inc., Symphony of Fire lights up the waterfront skies six nights each summer. 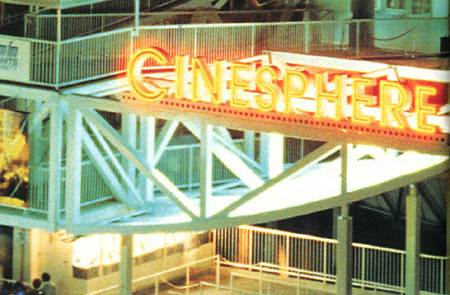 In its 25 years of operation, Cinesphere has featured more than 30 Imax films. "We've been in business so long that we've run most of the Imax films available," says Lou Seiler, senior manager of marketing and entertainment. "Each year we strive to run the two most current Imax releases, so we're constantly on the lookout for new product." "A recent Imax brand awareness survey showed brand awareness in Canada to be currently at 78 percent," says Robert Corrigan of Imax Corporation. "Cinesphere was the first venue to showcase this Canadian invention, and we're finding that filmgoers now refer to Imax films in the same way they refer to Disney films. Congratulations to Ontario Place for its pioneering spirit." The highest-grossing film in the theater's history—in fact the highest-grossing film at any single theater of any type in Canada—was the full-length version of "Titanica", Viewed by nearly 270,000 people, "Titanica" accounted for more than $2.3 million (CND) in sales. In 1991 Cinesphere also hosted the Canadian premiere of "Rolling Stones: At the Max" in conjunction with Imax Corporation and BCL, the Toronto company that produced the Rolling Stones' world tour. 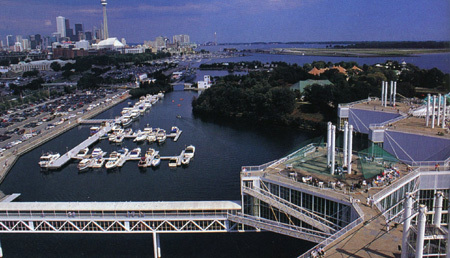 Ontario Place, with its 350 slip marina on Lake Ontario, is located just minutes from downtown. With the premiere of "Rolling Stones: At the Max" came the debut of a new sound system for Cinesphere, designed by Sonics Associates, Inc. The Sonics Digital Disk Playback System uses technology developed specifically for Imax theaters and offers a sound delivery system of unequaled quality. "While "At the Max" was the catalyst for the decision to move to a new sound system, the improvement has benefited all presentations at Cinesphere and has added to that sense of being part of the action," says Max Beck, general manager of Ontario Place. Over the years, Cinesphere consistently has been the most popular theater in Toronto, according to local reader polls. Although best known for its giant screen, the theater's popularity, has increased substantially due to the annual Cinesphere Film Festival. Originally created to feature newly released 70mm films, the annual festival, now in its 16th year, features a combination of popular 35mm and 70mm films. The five-month festival, which runs from January to May, attracts more than 100,000 movie buffs from within a 100 kilometer radius of Toronto. Cinesphere also boasts a highly successful educational film program, which is targeted to schools in central Ontario. The school program runs each year from October to May and features a variety of Imax film packages. In the past, the school film program has been packaged successfully with other special events at Ontario Place such as Dinosaur: The Greatest Show Unearthed, the 25,000-square-foot touring exhibit of rare new discoveries from Canada's Arctic and China. 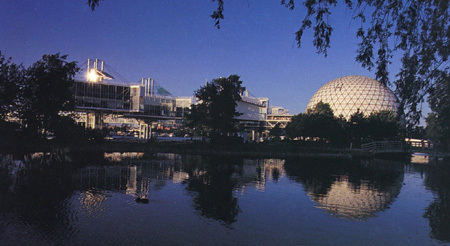 Although Cinesphere remains an anchor attraction, Ontario Place has added new features each year to maintain its position as an innovative leader in the tourism industry. Some of these attractions include the Children's Village outdoor playground, which opened in 1972. In 1985 major redevelopment of the West Island resulted in the Wilderness Adventure Ride, a $7 million flume ride, and a new outdoor stage called the Waterfall Showplace. A 160-foot-tall bungy jumping tower was added in 1992. The following year, an indoor/outdoor labyrinth arrived, known as MegaMaze and Hydrofuge, the first waterslide of its kind in Canada. "Sea Trek," a futuristic, deep-sea simulator ride developed by SimEx, Inc., opened in 1993. It combines special effects technology, large-format film, animatronics, and a simulator theater. Developments in 1995 include the Molson Amphitheater, a 16,000-seat outdoor state-of-the-art concert venue, and the Rush River Raft Ride, the first phase in a major waterpark expansion. Also added in 1995: the Atlantis Restaurant and Entertainment Complex, which houses the Deluge Nightclub, Toronto's newest hotspot with a capacity of 1,500. 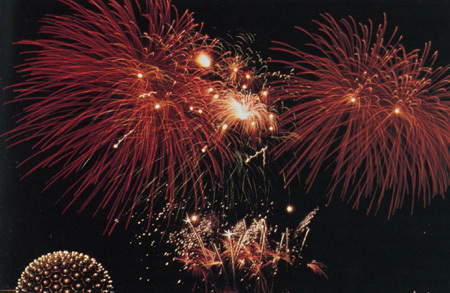 Ontario Place is home to the Benson and Hedges, Inc., Symphony of Fire international fireworks competition, which is enjoyed by nearly 2 million people along Toronto's waterfront during six nights each summer. The world-renowned Cirque du Soleil also calls Ontario Place its home, returning every two years with new productions that play to standing-room-only crowds. Planning is now underway for Cinesphere's future conversion to Imax 3D.